A black and white negative of a funeral wreath created by W.A. Cormack Florist Shop.The wreath is on a floral stand and has a large bow at the bottom of the wreath. W.A. 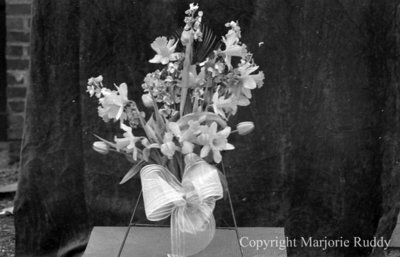 Cormack Funeral Wreath, April 6, 1938, Marjorie Ruddy. Whitby Archives A2013_040_976A.